I am looking at fitting some Paxton Paxlock Pro door locks to some doors in our offices (https://www.paxton.co.uk/products.asp?id=011,24&amp;strStage=product_page&amp;strFamily=net2&amp;strGroup=group-05145) to provide a basic access control system in our offices. These locks allow use of the mechanical handle on the secure side at all times. The locks are wireless and disable the handle on the insecure side until a token has been offered and access granted via the software controller. They don't utilise any maglocks or electronic strikes and essentially are self contained using battery power as they access control side is proximity activated (i.e. they are in power save until someone uses a token - then they authenticate with the system). The query I have is whether we need an electronic strike to go along with these to allow all doors to be opened from the insecure side in the event of the fire alarm being triggered. As the locks are self contained and proximity activated from the insecure side, they wouldn't work with a break glass type device on the lock itself but I wasn't sure whether we would need a strike that is connected to the fire alarm (to fail open in event of an alarm) as there is free exit from the secure side of the doors (as the handle mechanically allows exit all the time) and no other access control used on the final exit door. i.e. it's a clear path from the secure side to the fire exits. None of the doors which would have these locks fitter are final exit doors. 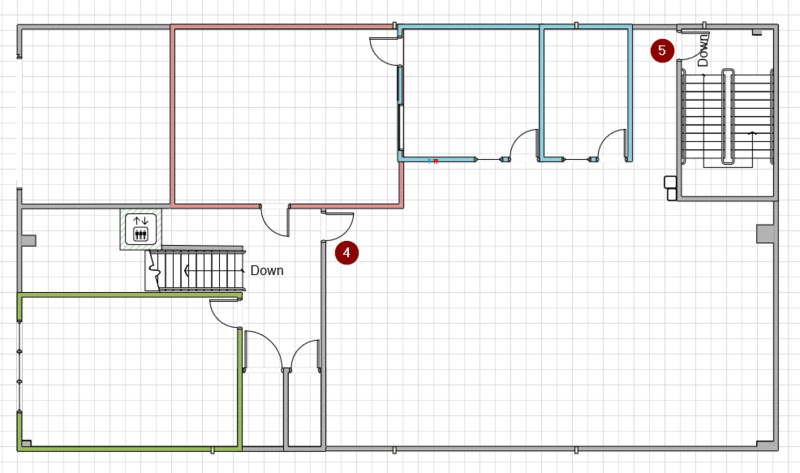 I have attached a rough image of floor layout, numbered icons represent doors where the locks would be fitted and the green path indicates the planned escape routes - the route in the back stairwell leads down to a fire exit door on the lower level (this would be in the top right hand corner of the diagram if we were looking at the bottom level). I hope the above is enough detail / appreciate any comments. I see no problem with the locks you propose but you need to check the means of escape. I am assuming the premises is a two storey building and it appears that the main office and the office in the top left have an alternative MoE without the need to use a card/key. But the office in the lower left only has MoE in a single direction because of lock 3, so I would suggest you check the travel distances to make sure the MoE conforms. I realised that the diagram I uploaded should have been clearer as I realised that it's a combination of both the up and downstairs, which doesn't make it easy to interpret. I've re-uploaded separate diagrams for both floors, but what you said still applies essentially due to the upstairs offices which are outside the boundaries of the main office and only allow 1 MOE due to lock #4. 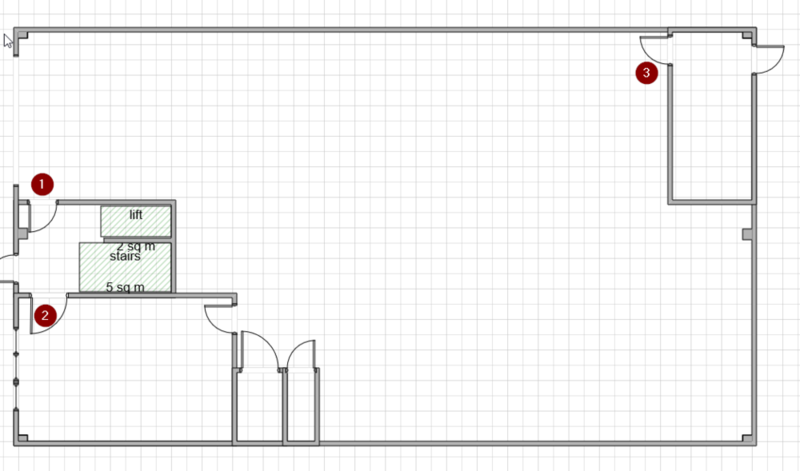 The door between the 2 offices at the top of the first floor diagram was planned to be locked (normal mechanical handle) but we're debating keeping it closed but unlocked as another MOE. I've checked the distance and it's approx. 18m from the inside of the upper office to the front exit, from what I can see this should be fine / up to 25m as the lower landing has low risk of fire starting / spreading ? There are many things that have to be taken into consideration when designing a means of escape, (MoE) so as I have often said I an unable to give you a definitive answer and that's why you need to visit the site or have detailed architectural drawings to be certain. I will assume the the staircase enclosures is the insecure area and you need a card/key to get into the offices but you only need the door handle to get from the offices into the staircase. This means you have exit from the furthest point in the offices to the final exit door to outside without requiring the need of a card/key. All the offices appear to have more than one escape route, (alternative MoE travel distance 45m) except the office enclosed in green therefore a single escape route is provided. (travel distance 18m) so I imagine you should have no problems. I do not understand the office in orange which appears to have a door that leads into you office and is not secured? The door in the orange office was actually into a cupboard, we extended the office to the right of it, in to it by removing the right hand wall of the cupboard to make the office a bit it bigger. The door on the left wall was left in place as they didn't touch that wall, just removed the right one. The intention is to ideally keep that locked which makes the main office totally secure. Appreciate all your comments on this and thanks for the info. The only problem is, that you have created an inner office situation so you need to consider that. Do you mean if the door is secured ? 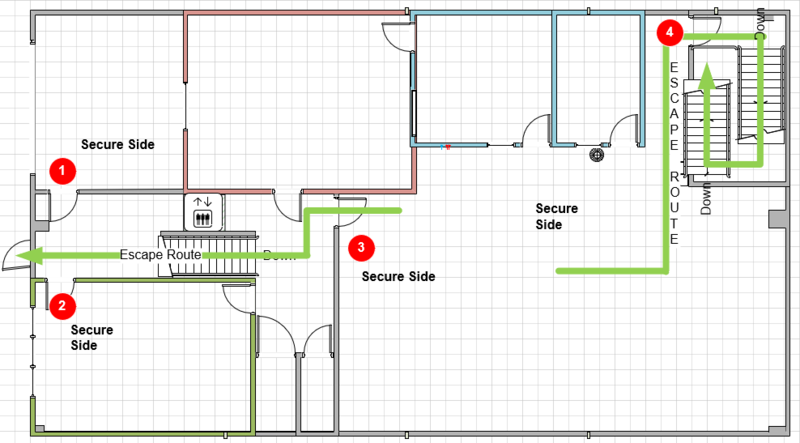 Yes, having an alternative escape is one method to resolve escape from a inner room (orange room) the other are having a smoke detector on the access room to warn the person in the inner room their escape could be compromised or having vision panels between the two rooms so persons in the inner room what is happening in the access room. Check out https://assets.publishing.service.gov.uk/government/uploads/system/uploads/attachment_data/file/441669/BR_PDF_AD_B2_2013.pdf page 34 paragraph 3.10. Thanks guys - will review.